Some of my favorite things to post about are family, food and items that I love. For Christmas, my aunt bought me a collection of delicious smelling lotions and sprays from Bath & Body Works. I fell head over heels in love. I left the cranberry set she purchased for me in Florida and I did some of my own skincare shopping to stock up my New York City apartment. 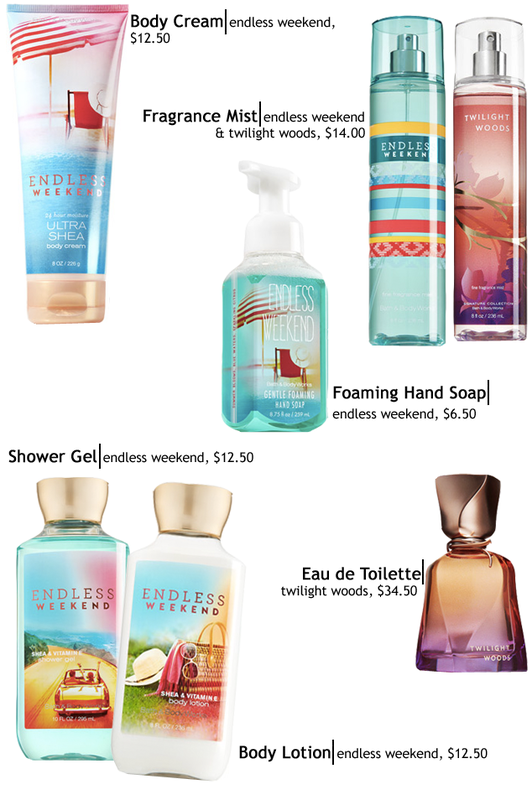 I was particularly drawn to the Endless Weekend scent and the Twilight Woods fragrance. Bath & Body Works is constantly having sales and I was able to purchase a large amount of items for a great price. The thing I really like about Bath & Body Works is that they make various products in the same scent so you can smell consistent. When I returned home from my skincare shopping the BF said, "you smell like a sorority girl. I like when you wear more sophisticated scents". Well, you know what I say to that? Thanks for the advice but I love my "sorority girl" smell. *Collage created by Gabriela Monsanto.